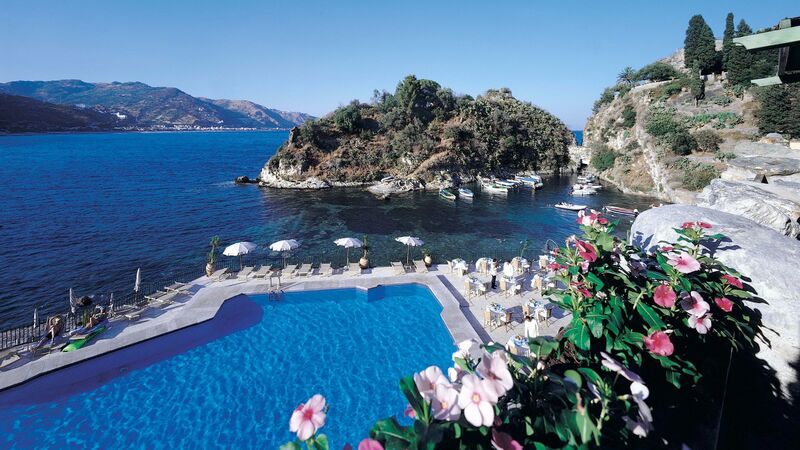 Holidays in Taormina take you to the spectacular Italian island of Sicily. It’s an upmarket town with all the trappings you expect from the glamorous side of Italy, including ancient Greek ruins and stunning vistas ideal for explorers. Couples will love the romantic winding streets of the town, as well as excellent dining options and some of the best views on the island. Families can explore Mount Etna and learn fascinating stories of ancient Greece. When it comes to beaches you’ll be spoilt for choice. Although Taormina is perched on top of a hill where it enjoys some truly spectacular views, simply hop on a cable car and you’ll find yourself on the coast in minutes. Mazarro is a pebble beach with a lido where you can cool off and tons of water sports options. If you prefer sands, head further along the coast to the Bay of Spisone where you’ll find a little cove full of locals. Luxury holidays in Taormina have been attracting a glamorous crowd since the mid 90s and still retains much of its beauty, romance and charm. Wander through its Medieval old quarter and take in the historic architecture before dining al fresco in charming piazzas. This is the perfect place for people watching, with elegant crowds walking past the street side cafés where you can relax with a cocktail, glass of wine or traditional Italian coffee in hand. 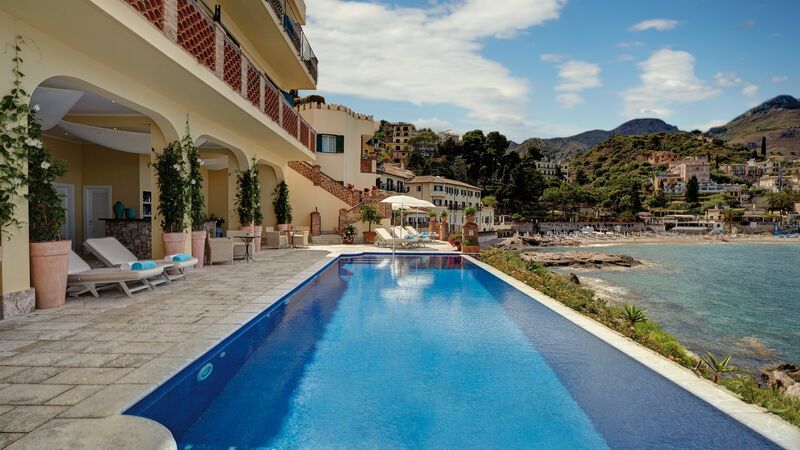 Speak to one of our Trusted Advisers today and we’ll help you find the right hotel for your luxury holidays in Taormina. 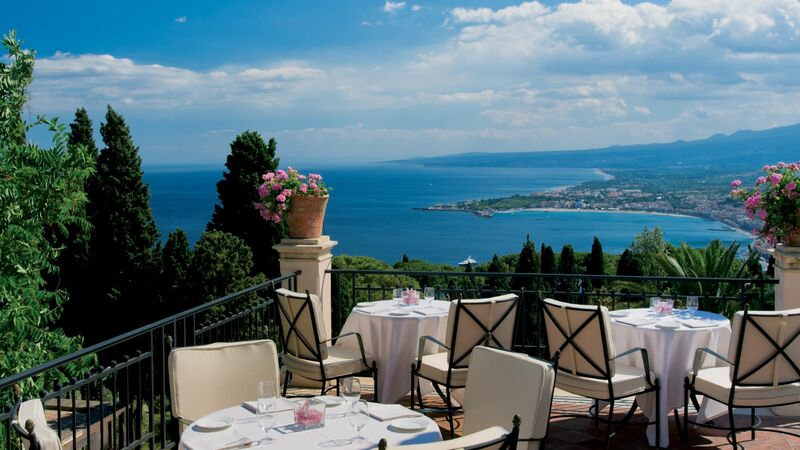 Stay at the Belmond Grand Hotel Timeo for beautiful views of the sea from its al fresco terraces which are surrounded by the emerald hillsides of the resort. The building itself is full of history and elegant architecture, with chic interiors and some exquisite dining options. Adventurers will love the close proximity to Taormina’s ancient Greek amphitheatre. Flight time from the UK to Sicily is around 3 hours. Transfer time from Catania airport to Taormina is approximately 1 hour. Sicily’s climate is classically Mediterranean, but since the island is surprisingly close to Africa, things really heat up here in summer. The hot, dry weather begins in earnest around June, peaking in the high 20s around July and August. It barely gets cold in Sicily; winters are warm and rainy, while spring’s pleasant mid-teen average is good for walking and cycling, but not quite beach weather. British citizens do not currently require a visa to visit Italy. When you dine out in Italy, you will generally be charged a coperto (cover charge), which is for the bread, tablecloth, cutlery, etc. Tipping in Italy is not customary, but is always appreciated. The official language of Italy is Italian. English is widely spoken too, so getting by is easy.